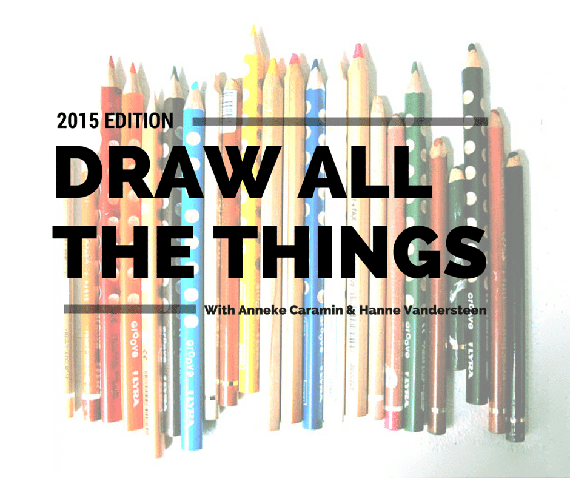 Anneke Caramin: Stamp all the things! As far as this drawing series goes, Hanne and I thought it would be fun to show a few easy ways to apply your new drawing skills to something even more practical than sketching figures and designing clothes: printing your own fabric! 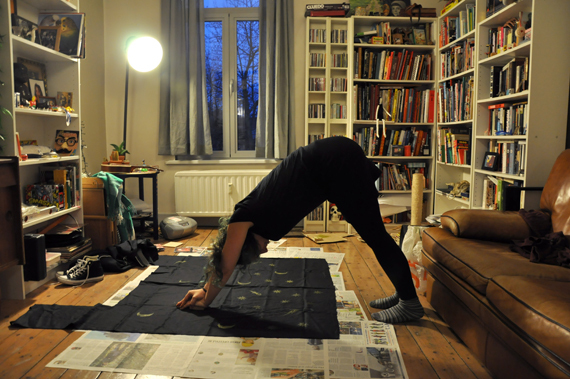 I'll show the fancy way to block print today, and tomorrow Hanne will tell you about a more low-budget way, using things you might already have lying around. First up: tools! 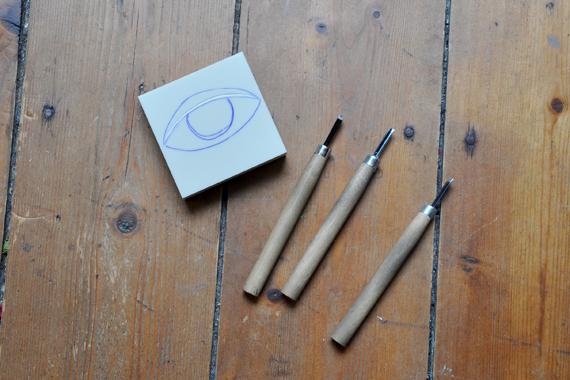 The main things you need are something to carve your stamp from, carving knives, ink and a brayer to roll your ink. You can find materials for stamp carving in almost any craft store, and I'd definitely recommend the softcut type over the harder lino for hand-stamping. It's a bit tougher to cut, but wayyy easier to print if you don't have a press! As for knives: you only need a few (I use a v-shaped one and two sizes of u-shaped blades most of the time) and if this is a sometimes thing there's no need to buy expensive ones. My knives are a dirt cheap set that were sharpened by my teacher in my first year of college, and they're still going strong! Same goes for the brayer. A small one is fine since you'll probably be making small stamps anyway! Just a heads up about ink: block printing ink will work best with this type of printing. Other inks or paints are usually too runny to make a good print. Oil-based printing ink should be fine for fabric that is going to be washed once it's fully dry, but Speedball makes a block printing ink for fabric that is pretty great, especially because you don't have to heat set it! (I've never seen it sold in Belgium but I've ordered from here before and had no problems!) No more ironing fabric for hours at a time! You could also use a thickening medium with regular fabric paint, but I have no experience with that personally. Now, on to the actual doing of things! First, you'll need to decide on a design and carve it out of your stamp. I use pieces of softcut material that are already mounted onto a block of wood, which works pretty well. 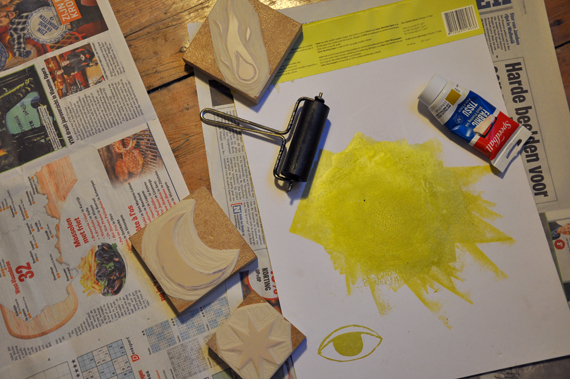 You can always glue your stamp to your own block of wood of course, which is easier to stamp with! I would recommend a simple design, using mostly large shapes and not too many fine lines. Use your carving tools to carve the stamp (I use the small v-shaped knife for outlines and then remove all unnecessary material with the u-shaped ones), making sure that the area that's supposed to be blank is carved down and smooth. 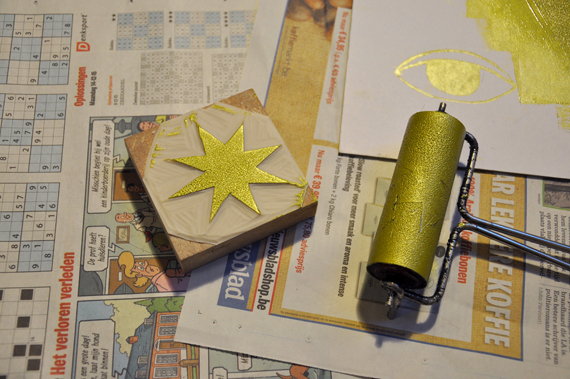 Next, roll the brayer all over your stamp. Don't be stingy with the ink! 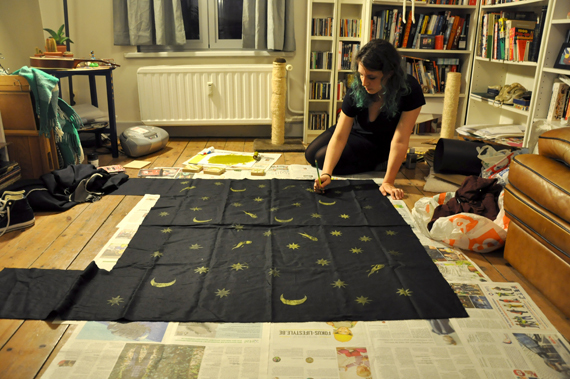 It's best to do a few test prints on scraps of fabric to see how it turns out. I had a different fabric (lighweight denim) picked for this but it turned out the ink barely showed up, so I went with black linen instead. Now print! And do some yoga while you're at it. You need to put some weight down on the stamp, but not as much as I'm demonstrating here, I promise. This was more being silly. I chose a random pattern of moons, stars and comets, but you can do anything. If you're doing something with a repeat, I would advise to put down a few guidelines in chalk first, to make things easier to line up. It's easy to lose track of a straight line when you're dealing with a big piece of fabric! I decided my print was still missing something, so I got one of those pencils with an eraser at the end and added a load of small dots. Done! Now all you have to do is let the fabric dry, set the paint according to instructions and think about what to make with your personal yardage! 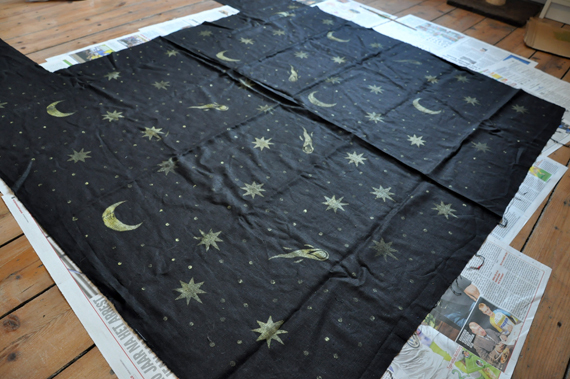 Here's how my fabric turned out! I'll probably make this into a skirt. Get inspired and then DRAW ALL THE THINGS! Draw all the things? Draw ALL THE THINGS!